A cultural truth: if you're celebrating a Jewish holiday, someone's been spending quality time in the kitchen to make it happen. Every holiday has its special food, whether it's latkes for Chanukah, apples and honey (or honey cake) for Rosh Hashanah, or matzoh for Passover. But my favorite holiday treats are the hamantaschen baked for Purim, the early-spring, kid-friendly holiday that celebrates the bravery of Queen Esther, a wife of the Persian king Ahasuerus, in revealing a plot by Haman, the king's advisor, to destroy a community of Persian Jews. By exposing her own previously concealed Jewish identity, Esther, the king's favorite, was able to plead for mercy for her people, and Haman and his plotters perished in their stead. It's a holiday that's cultural and historical, rather than specifically religious, and is celebrated accordingly as a kind of Jewish Mardi Gras, with reveling, drinking, dressing up, house-to-house visits, and (my favorite), mishloach manot, gifts of food shared with friends and neighbors. 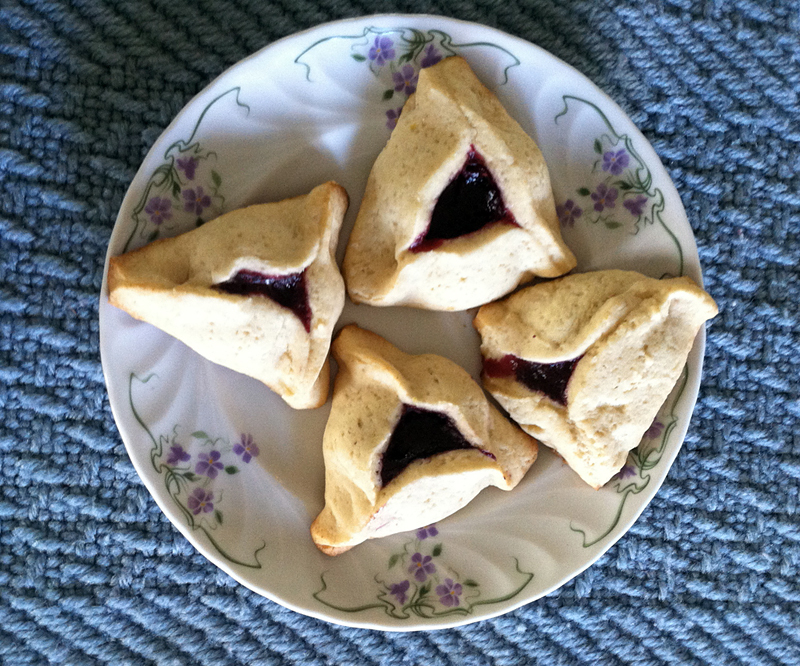 And always included in the mishloach manot are hamantaschen, triangular cookies with a plump center pocket filled with jam, ground poppy seeds, or chocolate. Some say they represent Haman's hat, others his ears or his pockets. However you translate them, they're a delicious, buttery cookie with a sweet and tasty filling. This gluten-free version uses a mixture of potato starch, tapioca flour, and rice flour. We've also taken a little inspiration from a recent posting about koolooschen on Jewcy, Tablet magazine's lifestyle blog. Writer Rachel Harkham's invention is a cardamom-scented cookie that's part Persian koloocheh, part Eastern European hamantaschen. For filling, she suggests whole or pureed dried sour cherries; we suggest raspberry jam or a tangy filling made from dried cherries, dried cranberries, and golden raisins. You can fill these with any number of fillings. Tradition calls for apricot or prune lekvar, made from dried fruit simmered with citrus juice, sugar, and water until soft, then pureed. You can also use a thick fruit spread, like raspberry or blueberry. We've included a recipe for a tart cherry-cranberry filling, made from dried sour cherries and dried cranberries. Note that the dough needs to be chilled for a few hours before rolling. If your dough remains too soft for rolling, you can roll it into balls instead. Poke the tip of your finger into the center to make an indentation for the filling, add a spoonful of jam or filling, then gently push the sides into a triangle shape. 1. Mix lemon rind and sugar together. Using a hand-held or stand mixer or a wooden spoon, cream butter with sugar until fluffy. Beat in egg, orange juice, and rosewater, orange-blossom water, or vanilla. In a separate bowl, whisk together flours, potato starch, baking powder, cardamom, and salt. Stir flour mixture into butter mixture, mixing gently until a soft dough is formed. 2. Flatten into a round, wrap in plastic wrap or pop into a resealable plastic bag. Chill in the refrigerator for at least 2 hours or overnight. (Otherwise, dough will be too sticky to roll out.) While dough is chilling, making filling. 3. To make filling: Place ingredients in a small, heavy saucepan. Warm over low heat, stirring frequently, until fruit has softened and plumped up, raisins have plumped up, about 6 minutes. Let cool for a few minutes, then transfer to a food processor or blender. Puree until smooth. Taste and add more sugar or honey, as needed. 4. Preheat oven to 350ºF. Lightly dust a large wooden cutting board or countertop with rice flour. Because this dough tends to be sticky, it’s easiest to roll it out with a sheet of waxed paper between the dough and the rolling pin. This will prevent the dough from sticking and tearing as you roll. Roll out dough into a broad round, about 1/4 inch thick. 5. Using a 3-inch cookie cutter or a drinking glass, stamp out circles of dough. Using a spatula, move the circles onto a cookie sheet, leaving an inch or so between each one. It’s important to fill the rounds on the cookie sheet (rather than on the countertop) as they are hard to move without tearing once they’re filled. 6. Place a generous spoonful (about 1 tsp, depending on the size of the round) of filling in the center of each round. Fold the right and left sides of the circle into the middle and pinch the top into a point. Fold the bottom half up to meet the folded-in sides. Pinch each side to seal, forming a triangle with a patch of filling peeking out from the middle. 7. Bake for 15-18 minutes, until cookies are pale golden brown around the edges. Let cool on a rack.